To ennoble a private house with its adjacent territory is much more complicated than an apartment in a high-rise building. A beautiful courtyard is the dream of many owners of estates. 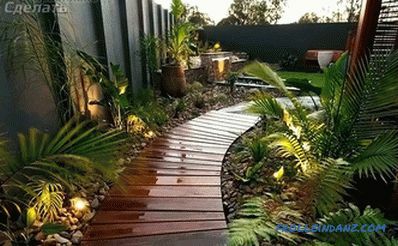 It seems that not everyone can afford to hire a landscape designer, who quickly and efficiently develop a suitable project. How to be in this situation? 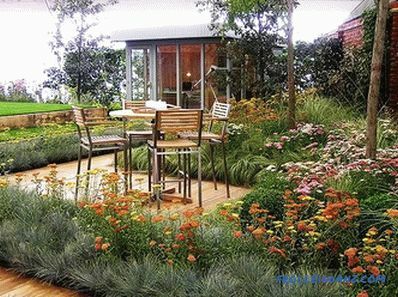 Before you take on the independent improvement of the territory of a private house, try to imagine what you want, in the end, to receive, and the practical recommendations provided in the article will help you determine the design of the landscape. 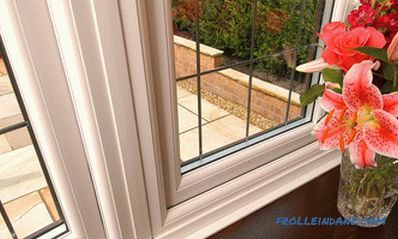 Everyone has his own ideas about beauty and comfort, which are expressed in the environment. Any trifle that pleases us characterizes us as a person. Although refining the yard does not provide for work with the use of special equipment, if you pre-do drainage and strengthen the slopes, you will be able to avoid many difficulties during the operation of the garden plot. If you are ready to attract additional labor, you will be able to realize any of your ideas. First, draw a plan of the site and draw on it all the planned buildings, landings, fences and paths. After this, it will be possible to proceed to marking the yard and its consistent refinement. Note, however, that the site must contain both sunny and shady areas. This will diversify the rest of the family, as well as make it more comfortable. When designing a local area, it is important to take into account the climatic features of the region. This affects both plant selection and construction work. Landscaping in a small area The house is, Of course, the main element of the site, so all other buildings should be constructed in the appropriate style. If your estate has a small size, then you should not experiment with styles. Remember also that the excess decor will transform the local area into a colorful patchwork quilt. And vice versa, if you have a large area of ​​a plot, then it can be zoned, bringing to life different thematic corners. 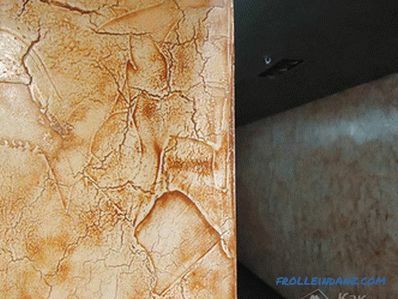 For example, rustic style involves the use of simple designs in the design. It combines with handmade decor, gravel paths and wooden flooring. Think about what functionality do you expect from the local area? What do you want to grow on it? Maybe it will be flower beds? Or are you planning to breed fish in a pond? Or maybe you like to relax in a lounge chair? In order for this variety of activities to harmoniously fit into the courtyard, it is necessary to divide the space into functional zones. 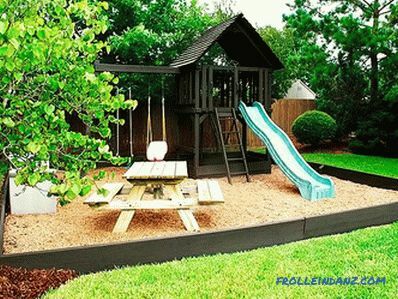 If you have children, then you need a playground. So think about which zones you need, which ones you want and which ones you can refuse. 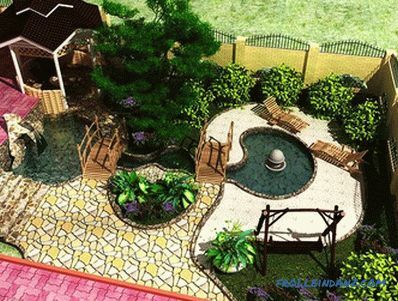 If you own a small yard, then try to combine some areas. For example, in an area for active games, folding chairs and a table can be put, thus remaking it into a place for lunch and board games. After such a pastime, all these items of garden furniture can be removed by reincarnating the lawn, say, in the field for playing ball. Zone restrictions can be hedges, bushes and perennials. Remember, the fence should not become dominant, so do not overload it. Fences can be added with arches or pergolas above the walkways. Such designs are particularly effective in the composition with flowering vines. Garden trellises, twined climbing plants, create the impression of a living wall. 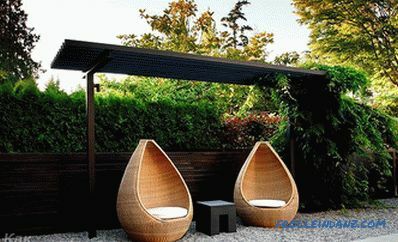 In this simple way, you can close your yard from prying eyes, and at the same time create a shady corner. 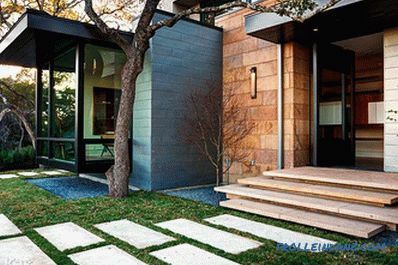 In the front part of the courtyard, paving stone, ashlar and concrete slabs look best. Often they are laid out so that the space between them can be filled, for example, with glass granules, sand or pebbles. Another design option is the planting of unpretentious low plants, among which are thyme, young, sausage and others. 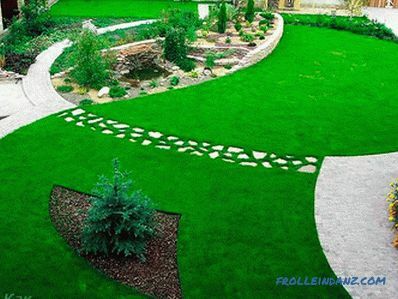 If you decide to design a courtyard in an informal style, you can make paths from woody cuts. The space between them is filled with crushed bark or sawdust. Such paths look attractive in the shady parts of the local area. 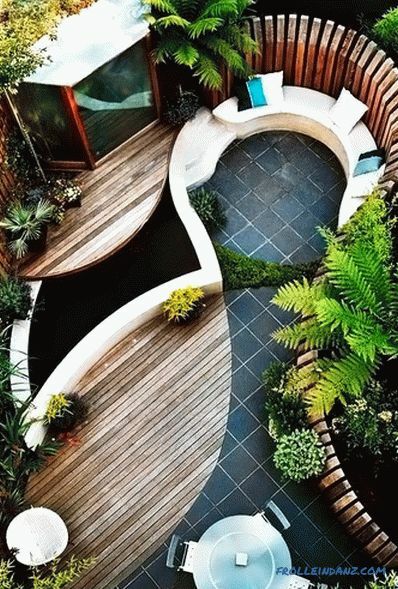 If you need a more restrained and elegant composition, then the space between the wood cuts is better to fill with fine gravel, sand of small fraction or gravel. 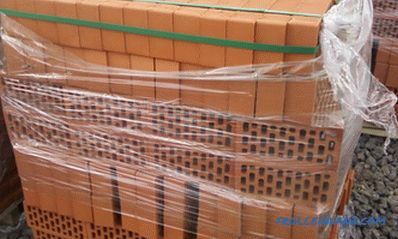 Often, narrow boards are used for paving, which are tightly interconnected. Such sidewalk, as a rule, is opened with varnish or painted.To simplify the installation of a path made of wood, you can use garden parquet, also called decking. The arrangement of the tracks should be done in accordance with the plan drawn on the paper. The closer the paths are to the house, the more restrained they should be. 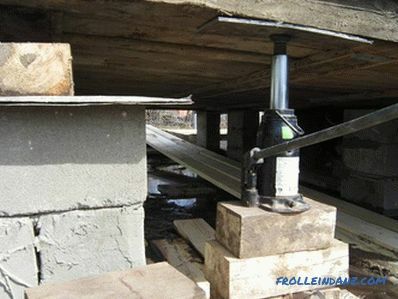 Therefore, for their arrangement it is better to use slabs, decking, paving stones or bricks. In other thematic areas, the tracks may be more informal. Sometimes, to create comfort and coziness in the yard, you just have to choose and plant vegetation correctly. If you have moved to the stage of landscaping local area, then start with the planting of trees and bushes. With their help, you can make the garden more diverse. In addition, trees and shrubs will protect individual areas from wind and sun. Want brightness in the yard? Then you can not do without planting brightly flowering plants. So, you can create a beautiful monophonic or multi-colored landscape. 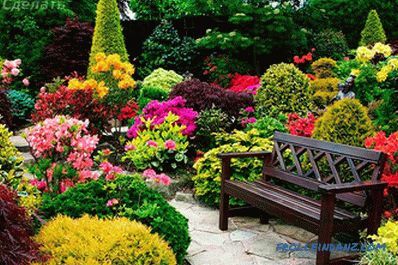 If you are engaged in landscaping a small area of ​​a private house, then give preference to plants that bloom continuously - one after the other. Such a flower bed will be attractive all season. Flowering yards are attractive, but landscapes with ornamental leafy plants, such as ferns, geyher, and hosts, look no less beautiful. Lawns are becoming increasingly popular. Although it seems that the grass is unpretentious, the lawn also needs to be looked after. Grass needs to be sown and cut regularly. In the dry summer, it needs to be watered daily. 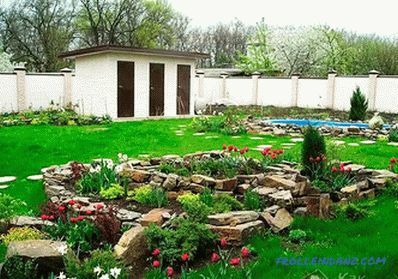 If you are improving the dacha, it may be better to make it fully paved. This yard is easy to keep clean. For landscaping such a yard, you can use the pot. This will allow you to settle any exotics in the yard for the summer, for example, lemon, cypress, pomegranate, etc. Vertical landscaping can create a relief garden volume. This is especially true in small local area. Fences, gazebos, tree trunks and pillars already erected in the courtyard can serve as supports. 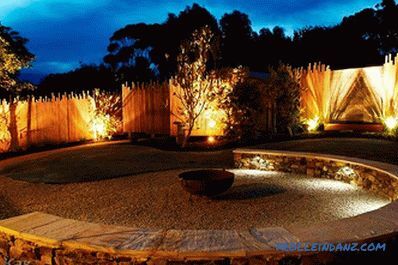 You can create a harmonious landscape with the help of elements of garden lighting, powered by solar batteries or from the mains. In addition to the functional purpose, they will give the exterior of the courtyard a special charm. As a rule, paths, ponds, plants and sculptures are highlighted. Floating lights create the feeling of a blooming oasis located on the water. LED lamps will help you create the effect of the starry sky under your feet. To illuminate the tracks you can also use the lights on the pillars. One thing is clear - well-designed and well thought-out lighting will decorate the territory of a private house. Garden decorations bring special and unique accents into the courtyard and help to create an orientation of the landscape design style. 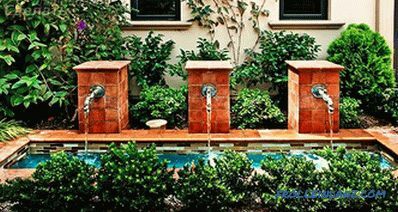 Sculptures or a fountain can be placed in open areas and patios. Garden figures made in the form of fairy-tale characters and animals are very popular in our area. But here it is important not to overdo it. Otherwise, you can turn the yard into a playground. If you care for animals and birds, you can place feeders, birdhouses and squirrel houses in the yard. 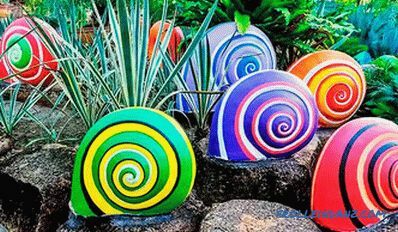 If you make them original, then with their help you can decorate the yard. 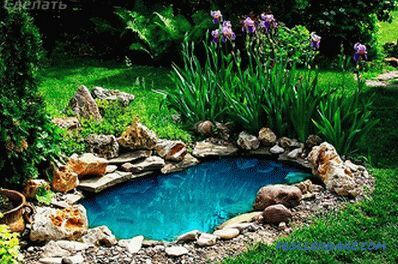 Ponds are designed for aesthetic pleasure. For their arrangement, the dug trench is laid out with a PVC film. 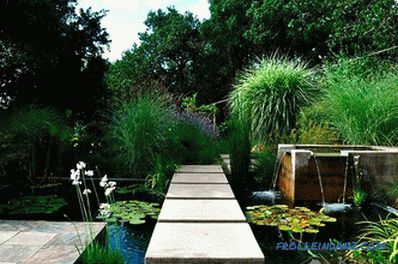 If you want to make a pond as close as possible to the natural one, then decorate its banks as naturally as possible. 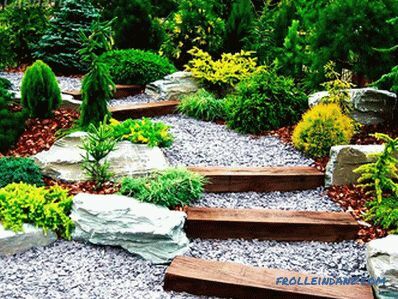 Lay them out with natural stones, such as pebbles. Around you can plant moisture-loving plants, such as water mint, sedge, marsh toffee and, of course, reed. At the bottom of the pond can be planted lotuses, urut, water lilies and other aquatic plants. Often ponds are complemented by waterfalls and fountains. The sound of water soothes and relaxes, promoting beneficial rest. Reservoirs are great for arranging recreation areas. 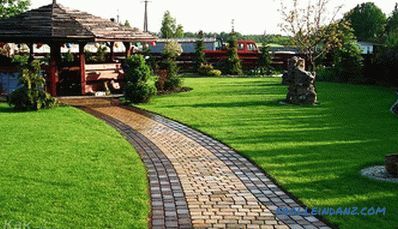 We hope that the recommendations outlined in this article will help you to make the yard of your dreams. If you have any questions on the topic, then ask them in the comments to the article.